This first Christmas ornament for a baby girl is delightful in every detail! 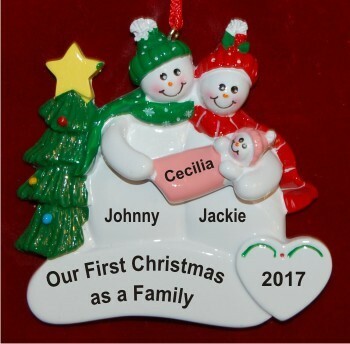 The Christmas tree snow couple with baby girl personalized Christmas ornament features festive colors and adorable design for your family or for friends. As a personalized first Christmas ornament, the information your provide is handwritten in durable paint to produce a lasting memento of this special holiday season. There is room on the reverse side for a longer message if you wish. It’s one of many personalized girl ornaments, a great start to a collection that grows along with her. Browse all our personalized first Christmas ornaments for girls to find your favorites.